Federal Communications Commission boss Tom Wheeler has said that he will issue written warnings to some US broadband carriers following an investigation that found some companies are still not delivering advertised speeds. Wheeler said that while the broadband market as a whole is doing a better job of offering users promised download speeds, some companies are still not able to give users the levels of performance offered in ads. Overall, the 2014 Measuring Broadband America report found that providers are delivering at or above their advertised speeds during peak hours. The report noted that DSL companies average 91 per cent of advertised rates during peak hours, while cable services average 102 per cent their advertised rates and satellite service, 138 per cent. As a whole, broadband firms average 101 per cent of their promised speeds, and 97 per cent during peak hours. The numbers fall in line with the 2013 test results of 97 per cent performance in peak hours and 96 per cent peak performance in 2012. But there were exceptions. Despite the solid overall numbers, in which many firms met or exceeded their advertised rates during the busiest hours of the day, the commission noted that some companies are still not delivering on what they promise to customers. 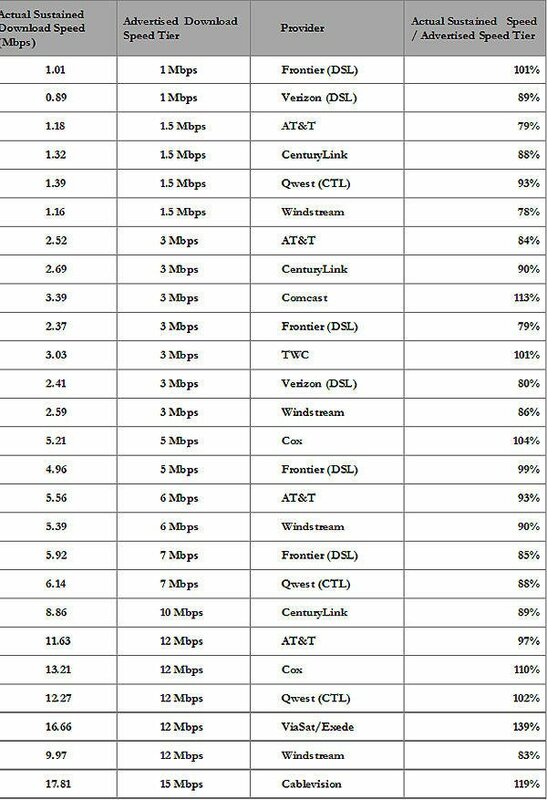 While major cable carriers Comcast, Time Warner, and Cox all delivered slightly better than their advertised speeds during peak hours – at 113 per cent, 101 per cent, and 110 per cent, respectively – Verizon delivered only 80 per cent, AT&T managed 79 per cent, and Windstream fell well short of its advertised speeds, at just 78 per cent. In response, Wheeler said that he would be following up low-performing vendors to inquire why their recorded speeds were lower than what they advertised in the month-long survey. "While it's encouraging to see that in the past these reports have encouraged providers to improve their services, I'm concerned that some providers are failing to deliver consistent speeds to consumers that are commensurate to their advertised speeds," Wheeler said. The report also noted that DSL services as a whole lagged behind cable and satellite broadband providers. In addition to being less likely to receive their promised download and upload speeds, DSL customers as a whole have lower rates of data consumption than users on broadband and satellite.